The study of over 200,000 women concluded that a preference for early mornings reduced the risk of breast cancer by 40% compared to women who were ‘night owls’. What’s more, the study found that women who slept longer than the recommended seven to eight hours per night had a 20% increased risk of breast cancer for every additional hour slept. This important finding reinforces the importance of a yogic lifestyle, demonstrating the profound connection between sleep patterns and health. Ayurveda has a simple formula for improving your health and wellbeing. It’s called Dinacharya – your daily routine. Dinacharya is designed to optimise your mental, physical and emotional functioning through regulating your sleep/wake cycle, exercise, food habits and more. It’s a simple routine that encourages the body to recover its natural balance which, in turn supports your ability to work, rest and play. Healthy sleep patterns are part of a ‘whole lifestyle’ approach to wellbeing. Following the standard advice to turn off your screens and do a relaxation exercise before bed can be helpful, but this doesn’t address many of the factors that contribute to a poor night’s sleep or a reinforce a habit of sleeping late. The suite of lifestyle habits in the Ayurvedic Dinacharya routine gets to grips with the underlying imbalances that keep us stuck in a ‘night owl’ pattern. Here’s how. Routine: When it comes to healthy sleeping patterns, routine can work for you or against you. It all depends on the balance your Ayurvedic constitution. If your Kapha Dosha is imbalanced, it’s easy to get stuck in an unhealthy routine – getting to bed late, hitting the snooze button every morning, eating too much late at night. If that sounds like you, it’s important to break that routine by varying your habits. Diarise three nights each week where you break your regular routine. Perhaps you make an early dinner date or arrange a social event after you’ve eaten rather than before. If your Vata Dosha is imbalanced, you’ll notice that there’s very little routine in your life. You probably eat, sleep, work and socialise at different times each day, with every week bringing a different schedule. This kind of lifestyle can significantly impact your ability to be an earlybird. As much as you might hate the idea of a fixed routine, you’ll benefit from building some regular habits into your day. Try eating your meals at the same time each day (making your main meal lunch and finishing your last meal before 8pm). Diet: What you eat, and how and when you eat it, can have a big impact on your sleep patterns. According to Ayurveda, health and wellbeing begin in the gut. When your digestive system is working well, you stay healthy. When your gut is sluggish, you’re at risk of disease. Dinacharya helps us to avoid over-eating and eating too late at night (two things that can make you feel wide awake at night and sluggish in the morning) by offering simple recommendations for how to eat. First up is portion size. Each meal should never exceed the amount that you can hold in your two cupped hands (your OWN hands – the amount you can hold is proportionate to the amount you can healthfully process). Secondly, the first meal of the day should be taken AFTER the last meal of the previous day has been evacuated. That way, we’re not overloading the body’s capacity to process and eliminate waste matter. Next, we’re advised on how to prioritise meals. Lunch should be the main meal of the day, with dinner being a lighter meal. Which brings us to the question of mealtimes. Dinacharya recommends leaving regular intervals between meals, such as eating breakfast at around 8am, lunch at midday and dinner at 6pm. While mealtimes can vary a little day to day, it’s best to stick to a routine if you can. The way you eat is also important. Do you spend hours finishing a meal? Do you rush your lunch as you multitask at your desk? Perhaps you grab a sandwich on the run. Ayurveda recommends sitting quietly and calmly while you eat, avoiding eating when you are upset or excited and finishing your meal in silence if you can. What do you do when you finish a meal? The chances are, you sit back and relax. While it’s fine to relax while you digest your meal, it’s not a good idea to nap (and if you’re eating fresh seasonal food at regular times and portion sizes, you probably won’t feel too sleepy after eating anyway!) However, taking some gentle exercise after eating will improve digestion and help you sleep better when bed time comes around. Try a short walk after each meal to kick start digestion and help you stay balanced. But what should you actually eat? Ayurveda recommends eating according to your body type (dosha) and varying your diet to prevent and address imbalances in your dosha as they occur. If you want to eat according to your dosha, it’s best to meet with an Ayurvedic doctor or a yoga therapist. However, a good rule of thumb is to stick to fresh, natural, seasonal, locally grown food. Keeping the body fit and healthy is an important factor in regulating your sleep cycles. Over exercising or being too sedentary can both negatively impact your sleep. 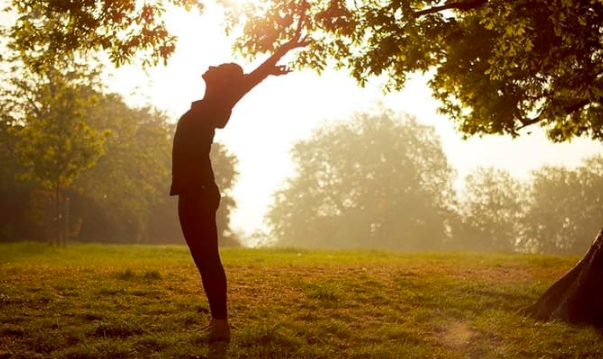 Ayurveda recommends practicing yoga in the mornings before breakfast. You don’t need to do anything too strenuous – 15 minutes of gentle, mindful movements combined with the breath will do. As with your food choices, the kind of yoga practice you do will depend on your dosha. You can speak to a yoga therapist about developing a yoga practice designed for your dosha or you can learn more about doing the right yoga for your type here. Yoga helps you to balance your body and mind in ways that make it easier to fall into an ‘earlybird’ sleep pattern. As well as developing healthy food and exercise related habits, yoga offers mindfulness, mantra and pranayama (breathing techniques) to calm the mind and regulate the autonomic nervous system, bringing your body-mind back into balance. Yoga and Ayurveda take a holistic approach to wellbeing, balancing your body, mind and emotions through simple and do-able practices that everyone can enjoy. When you come back into balance, it’s easier to develop healthy earlybird sleep patterns and reduce your risk of illness. These fundamental guidelines for healthy living are key to making the lasting changes you want to see in your life and will contribute to a healthy 'early to bed, early to rise' sleep pattern. Ayurvedic diagnosis and lifestyle plays a major role in the Adore Yoga Therapy training programs. Learn more about studying yoga therapy and using ayurveda to help people here.